Our windows are still open and I am grateful. My body aches to the core when the air conditioning is on. But our windows open has little to do with dinner on the go. A little. Just not a lot of a little. It’s baseball season and with two playing in a city rec league (Forgive me Father, I know what we do. We pay our property taxes there, that is my only weak defense. ), so with two boys in rec league, we often have several evenings to enjoy games. Add in tennis, golf, or swim team practices beforehand and we are leaving the house at 330p not to return until 930p. We’re not often going to eat out. It’s not good for us, teaches convenience over value, demonstrates poor time management, and there just isn’t time. 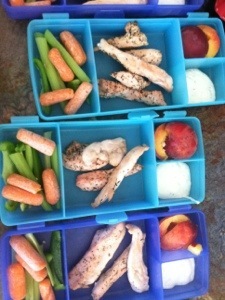 So I pack dinner these evenings. 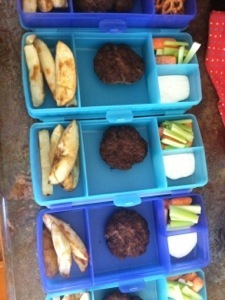 The kids each have a Tupperware Lunch ‘n’ Things container. These are the greatest bento-like boxes ever. Tupperware no longer makes them but there are lots on Amazon and eBay. I stack these in an insulated market tote cooler with two large reusable ice thingies. 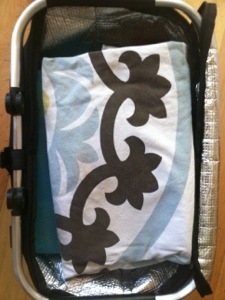 It all fits in one cooler just right with a blanket, cloth napkins, and silverware. 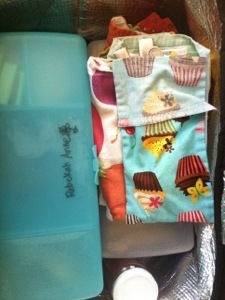 I try to vary what I pack. Last night was grilled herbed chicken with veg strips and a peach. Tonight is rosemary and chive beef patty (aka hamburger steak) with salt and vinegar home fries and, of course, veg strips. And I try to have something quick and easy and cool for when we walk in the door so late. Yesterday I made a chicken pasta salad from last weekend’s grilled chicken. It was just right to sit and eat on the deck. And that is the best part of packing dinner to go. We come home to a clean and calm house with no hurry or worry. I am grateful. I also keep a snack bin in the truck. Sometimes it is pre-made (goldfish, lance crackers, etc) but usually it is homemade (granola bars, fruit leather, pretzels, protein balls). At this moment it is both. But all those glass and Tupperware containers, while ideal because they cut down on waste, are not always ideal for on-the-go. So to combat the commercialism of food, I will be wrapping my own. 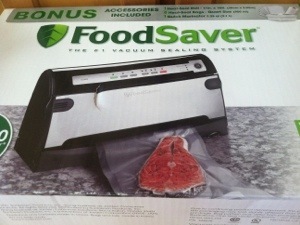 I bought this FoodSaver today. I hope to give it a try over the next few weeks. I am thinking it will be most ideal for granola bars and fruit leather. I’ll surely share. Maybe a mother is doing all she can for her kids as she can’t handle the use of A/C. there is just a little problem as you learn how to deal with heat & the cold air you get from your vehicle. Besides there is a need to stick with your title you put your post under. Nothing wrong with the post, but title could be changed to fit your post. Read my posts & see how I have them.